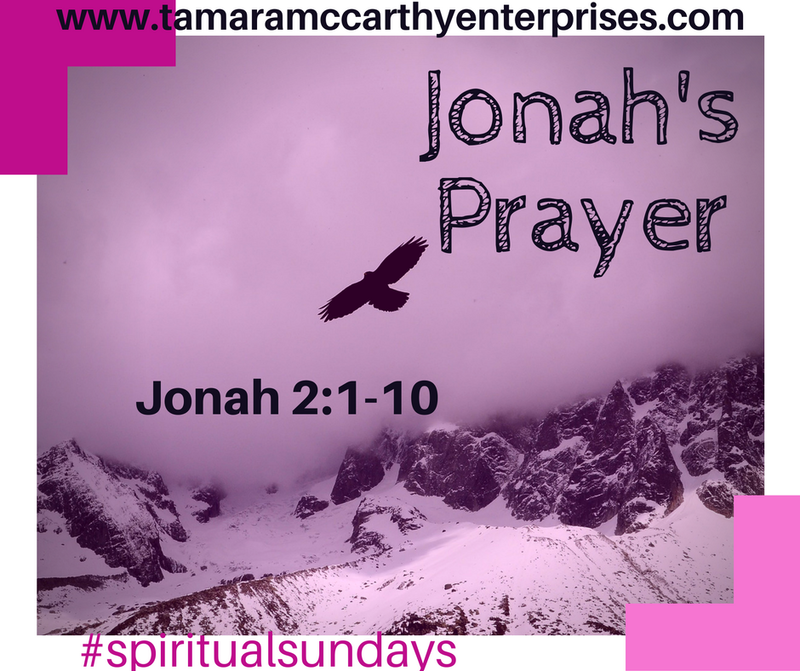 Jonah’s Prayer: I wrote this back in 2012; I shared with a women’s empowerment network that I belong to and I want to share with you! Enjoy.. I had heard of the story of Jonah many times but I had never read it for myself; today I had that opportunity and was in awe the whole time. This story can bring some relief to many who meditate on it and can relate to many things that took place. The main point in this story is that you may be in over your head and it may seem like there is no end in sight but God is just one prayer away. Cry out to him and let him know you are in distress! We know that God sees and hears all but just like you and me having to feel like we are needed; God is the same way. He wants to hear your voice he wants to know that you need him and that you have finally realized you can’t do anything right without him. Are you the problem and the solution? Many times we asked ourselves “Why is this happening to me? Why can’t I get any help, doesn’t God know I am going through all this? Why is he being silent?”. I have had to asked myself the same question many times when faced with many problems and then I get my answer “why haven’t you done the things I told you to do? Why haven’t you listened to me? God is a loving and forgiving but he doesn’t talk to hear himself speak; he wants us to hear him and do as he says. How many times have you said something to your child and they just turn their back on you and act as if they didn’t hear you? How many times have you told your child to not do something that you know is going to hurt them in the long run and they do it anyway; only to come to you after they learned the hard way that you were right and trying to protect them. As the New Year draws near and we leave the previous year behind us; cry out to Our Father and allow him to rescue you. Don’t try to go into the New Year on your own; give it all over to him; who as already shown you that without him you can do nothing. He has so much good in store for us all in these new season that is just hours away. I am happy to be going into a new season knowing that I have a Father that loves me unconditionally and no matter what I go through he is always there to rescue you and show me the right way to go! All I have to do is cry out and signal that I need help. All Your breakers and billowing waves passed over me. Then I said, I have been cast out of Your sight. Nevertheless I will look again toward Your holy temple. The waters surrounded me, to the point of death. I descended to the [very] roots of the mountains. Yet You have brought up my life from the pit (death), O Lord my God. [a]Turn away from their [living source of] mercy and lovingkindness. I shall pay that which I have vowed. So the Lord commanded the fish, and it vomited Jonah up onto the dry land”. Do you have some changes to make? Write them down and start the process! Don’t You Ever Give Up!! You Keep Fighting! 1. Have you ever wanted to just give up? 2. Have you ever felt defeated? 3. Have you ever thought it just won’t get any better? 4. Have you been praying and it looks and feels like you’re being ignored? Did you answer yes to any of these questions? How did you deal with it? Are you still standing? Well let me say this; if your reading this and you answered yes to any of those questions; then you made it and you decided not to throw in the towel! 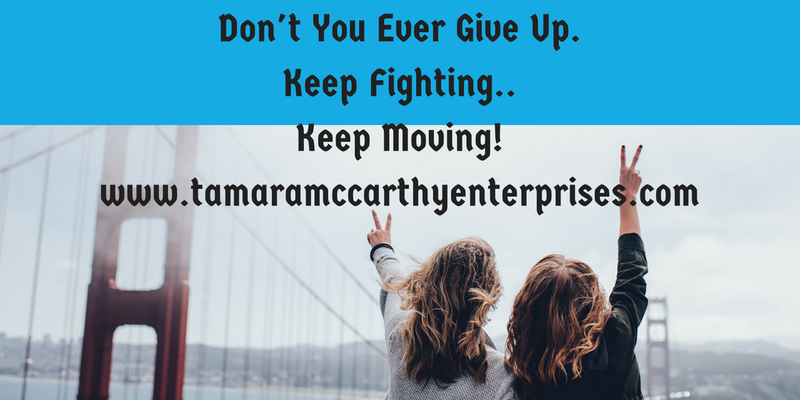 Life can throw you lots of curve balls, knock you down and pick you back up! Many times you don’t even see it coming and you don’t get a change to prepare for it or even block it! But God! Trials will come! Life will happen! Decisions will be made! But God will always remain the same! Wherever you are in your journey just know that you aren’t alone..
Those times when you are feeling down and out; meditate on this! I had the opportunity this weekend to attend my very 1st Vision Board Workshop; and I have to say I had an amazing time! 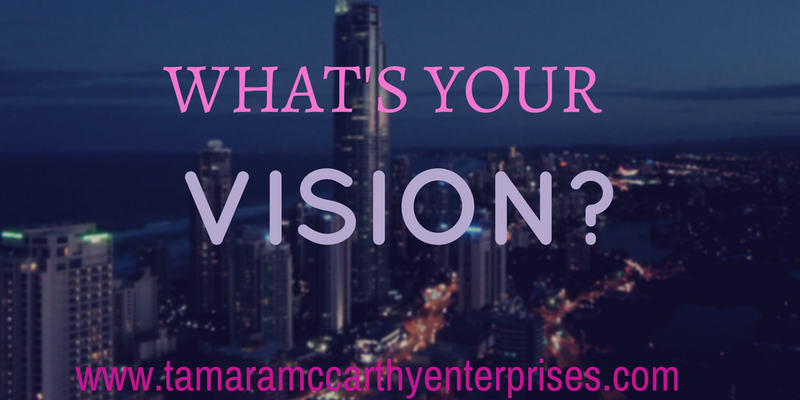 Have you ever completed a vision board before? Have you done it on an individual level or in a group setting? Which do you prefer? Having done mine in a group setting that was very enlightening for me; it’s like you have a guide and a cheering squad motivating and inspiring you as you looked for the pictures and words that would transform your blank board. What would you do with a clean slate? That scripture right there blew me away! I heard it before but hearing it again just stirred something up inside of me and now I’m just excited for what’s to come! But I have to follow instructions! I can’t just expect something because the words are there; I have to put action to it! I need to do my part and get in position! It’s like when you watch a race and they are on that starting line up; they are stretching and probably doing breathing exercises and getting their mind right! But before they got to that point they had to prepare their bodies, they had to eat right; this had to be something they did daily in preparation for the race! They had to make sacrifices, probably lost some friends along the way; because they were focused on the prize! What is it that you have been called to do? What is your purpose? 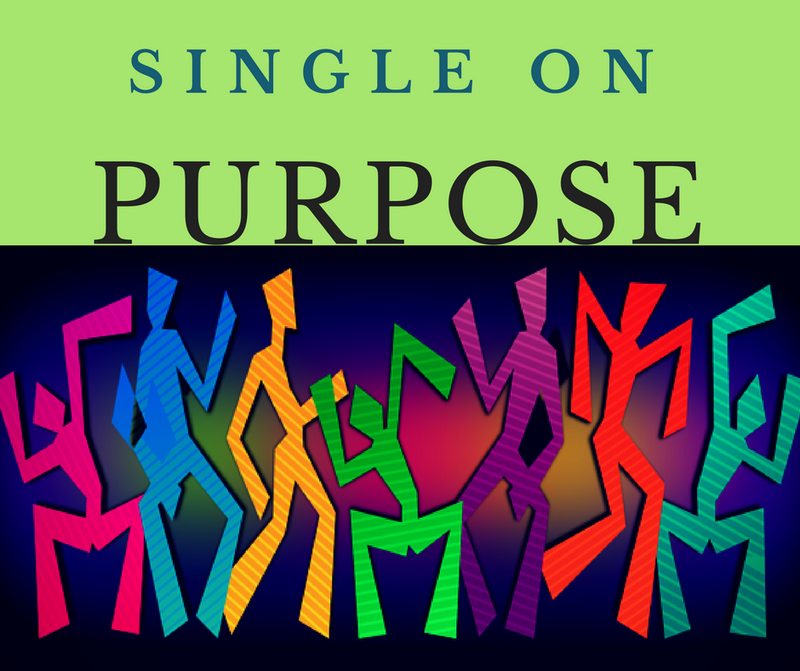 Have you found your purpose yet? Have you lost friends and wondered why? That business that you have been talking about; have you created a business plan, talk to investors, apply for business loans; get a business partner! What about your elevator pitch! All these things need to be done before you go looking for office space. Everything has to be done in proper order! We have to get on point! We need to be in formation! And we need to put pen to paper and make it real. What are you waiting for? A couple of months ago my husband and I found ourselves surrounded by intelligent, talented and extremely beautiful women. My husband is SUCH a gentleman that his expression never changed, his head never turned and his soulful eyes remained gazed upon me; however, I have to admit that I felt a bit small that day. I mean, these women had perfectly coiffed and colored hair, their makeup was PERFECT along with their teeth and their outfits were enhanced by sashes. Some of them even wore crowns on their heads! For the second year in a row my husband was invited to participate in the Ms. and Mrs. Florida United States Pageant, which occurred in Volusia County, Florida and I was there to witness the crowning of a queen. What makes a queen these days? Baby Charlotte was born into a royal family but she wasn’t born a queen. I think her official title is “Her Royal Highness, Princess Charlotte”. I heard the news media refer to her brother as the “Heir” and she as the “Spare”. I don’t know that I would want to be referred to as a “Spare”… but in England, she was born into prestige and wealth, so maybe that makes up for it. The beauty pageant contestants (referred to as Delegates) are all competing to be The Queen. It’s actually quite an impressive competition! A showcase of wonderful women who all fit into a list of qualifications; seeking an opportunity to represent their county, city, state and the platform that is most dear to them. We heard about cancer awareness and domestic violence during their speeches; we learned about the families that raised them and we learned about their goals. Pageantry certainly draws quite an eclectic mix of wonders to its doors! Let me tell you about Dr. Veronica Duncan Walters from Tampa, Florida (Dr. V). My husband Bartee and I met her during the 2014 pageant. When Pageant Director Pam Bolter invited my husband Bartee to be a judge, all I could think of was half naked, 6-foot tall lovelies parading in front of my hubby, blowing him cleavage-anchored kisses in a bid to secure his vote. Bartee and I had only been married for 8 months at that time and I wasn’t about to let temptation enter our honeymoon, so I asked Pam if I could tag along… with my shot-gun in my purse (lol). She agreed to put up with me, and I will be forever grateful for attending. I was seated strategically behind the judges so I could witness it all. I had my trusty camera with me and snapped a few pictures. Several delegates bounced into the room and wowed the judges but when Dr. V entered the room, the atmosphere changed! The illumination that radiated off her shoulders was indescribable! The confidence, the joy, the ease upon her face even made ME sit up a bit straighter! Out of the dozen or so delegates that faced the judges that day, she was the only one my husband directed a question to… and she NAILED her answer. On this particular day she was a Queen, you could tell she was a Queen and that she had been a Queen for some time. Gifted me with a global radio show – we celebrated our tenth year on the air last summer. Directed me to launch an outreach TOUR five years ago which now includes a Holy Hip Hop concert and SIX testimonial workshops! Led me to write my first book detailing the depression and final suicide attempt and a second book detailing my 200 pound weight loss! God blessed me to marry the man that calls me his “rib”. Bartee and I met in February 2013, he proposed in May 2013 and we married in August 2013. LOOK AT GOD! The price for my life then was a temporary bout with darkness that I still live with everyday… but the title that the Lord graced me with was QUEEN. He named me “Da Queen Bee” and I buzz about as a round, yellow, busy-little-bumble bee for Christ. People ask me why “they” call me “Da Queen Bee” and I reply: “That’s the name that God gave me”. What makes a queen these days? How can YOU be granted the title of QUEEN? The baby Princess will be fully grown one day and she may own that title, or it’s possible she will always be called the “Spare”. Dr. Veronica won a crown and a title on that April day in 2014. She was crowned “Ms. Inspirational United States” and I promise you that her crown was bigger and more glamorous than the other Ms. and Mrs. Queens that were also crowned that day! My Lord and Savior died on the cross for me many years ago, and even though I didn’t know it then, when I dedicated my life to serve Him I became a Queen. After the 2014 pageant ended, I became friends with Dr. Veronica Duncan Walters. She has made appearances during our TOUR workshops, sharing her testimony of motherhood and her path to the crown. I also came to find out she is the founder and PASTOR of a church in Largo, Florida (The ACTS Church International) and her congregation encouraged her and drilled her on her pageant entry skills! When I interviewed her for my TV show, it was just following her SECOND pageant where she won several additional titles! How does a Pastor decide to compete in a beauty pageant? The Lord led her to it! She is a Queen in His Kingdom. Her official appearances and the doors that were opened to her allowed her to be Inspirational… to be a witness to his Love and Glory. My husband, Bartee sang at the pageant last year while also serving as a judge, and this year he brought his karaoke show for the delegates to enjoy. They had a great time singing and dancing together after dinner on the night before the pageant. Bartee sang for the audience again during the pageant, it was just before the Queen was announced and I’m excited to say that pageant founder Pam Bolter invited us BOTH to return this year to serve as judges! In 2015 the delegates came from Florida AND Georgia and there was more diversity among the ladies. There were some shorter ladies and some curvier ladies… and I didn’t feel so small standing among them. I saw some familiar faces from last year and I’m following several of them on Facebook. They are representing their platforms and fulfilling their goals with elegance. I’ve even been watching The GOOD LIFE Channel 45 in Orlando and one of the show hosts announced that she was a Florida pageant Queen over 40 years ago! WOW! Royalty! Kings and Queens among us! If we claimed our Kingdom crowns what could we accomplish in our lives? What could we accomplish for others? What kind of wives would be? Consider this: How could men honor and love their wives if they acted like Kings and treated their wives like Queens? ROYALTY! Recording artist Mali Music sings those lyrics in his song… ROYALTY! “Lift your head, come back home… we are a chosen Priesthood of Royal people…ROYALTY”. Have I ever thought about competing in a pageant? No; not since I competed with Alpha Phi Alpha Fraternity Xi Chapter, way back in college. Have I ever dreamed about marrying into a royal family? Not really. 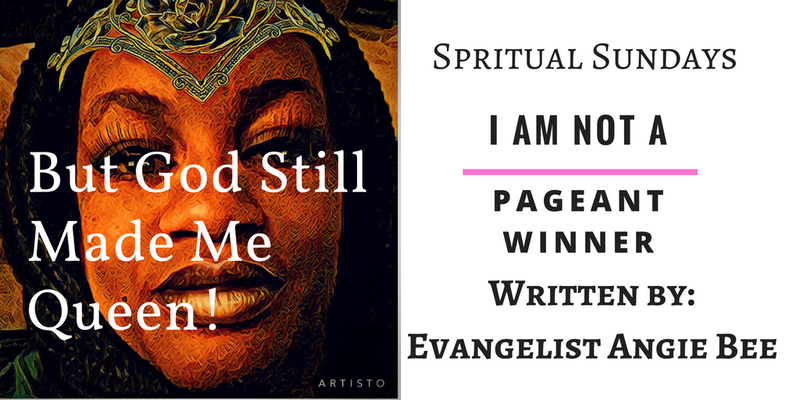 Do I feel like I am a Queen just because I have an award-winning radio show or lead an award-winning ministry workshop? Scripture and love surrounded me even when I didn’t appreciate the value of it! Today, God revealed to me that I am certainly His child and He put it in print, even way back then. What has God written about YOU? Think about it! (P.S. – Angie BEE and Bartee Productions declare the month of June as “Black Man Awareness Month”. We ask you to share your positive stories of a Black or Brown man in your life and how he has impressed you and his community. We will share these stories in an upcoming article. Romans 10:17 says that “Faith comes from hearing”… so let’s hear stories about our men and let’s build our faith in the men that God has given us!) Visit us at www.Facebook.com/AngieBEEandBarteeProductions. Contact me today with YOUR story! I have been trying to understand for sometime know why all women can’t seem to get along, support each other, love each other, motivate each other, encourage each other and inspire each other? You see men do it all the time! Well at least I think they do! I see it all the time. You can be out and you see men fist bump! Shake hands, giving each other high fives and the majority of the time they don’t even know each other! What is going on ladies? What do the guys know that women don’t? Are men better than women? I think they go through some of the same isssues women deal with as a whole. Right? You hear about guys sleeping with their friends wife or girlfriend, you hear about them fighting over some chick, you may see them get in a disagreement or two; but they always bounce back! They talk it out; grab a drink or two and they are cool again! Not to say this should be normal behavior but just pointing out how they overcome some pretty bad situations. Now women; we can borrow a dress and get a stain on it and you are ready to fight and draw blood! You want to end 10 year friendships over the littlest things! You won’t speak to another women because her hair is cute, she got a nice shape, she looks good in pink and you hating? Ladies! We really need to be better and realize none of that stuff matters! How many friends do you have? Do you pray for them? Do you listen to their problems or their frustrations and offer them sound advice? Or do you talk about them behind their back? Do you add to their stress or do you try to help them overcome it? I can actually count on my hand how many friends I have and I only have to use 1 hand. I don’t do fake and phony; never could and never will. You can sense when people don’t like you and it’s cool but I’m not gonna act like we cool and have you talking mess about me once I turn my back. I have dealt with this kind of foolishness over the years and still don’t understand it and it’s worse in the workplace! Women always act like we are in some kind of competition and for me that’s never the case. If I’m hired for a job I intend on doing that job I’m not trying to come and take yours! Do you deal with the same on your job? What about when you decide to start your own business; do you have many supporters or are they giving you reasons why you shouldn’t launch? This can be the same for ministry, writing a book, or just about anything that would be considered positive. 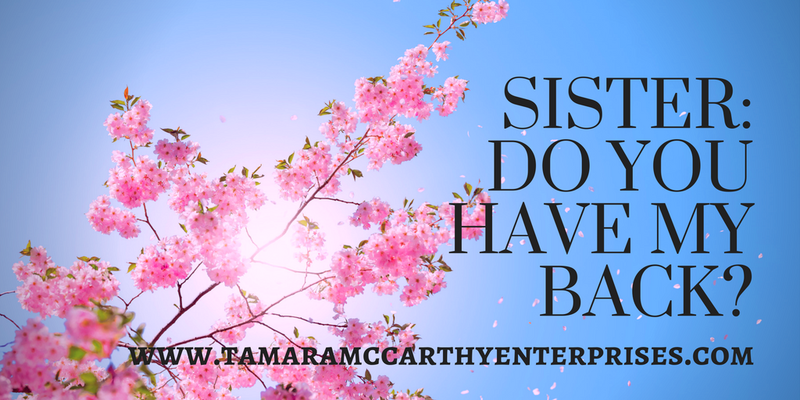 Why are we always trying to keep another sister down or shackled? Isn’t there enough of God’s goodness to go around? Don’t you think when he was instilling purpose in us and the plans for our lives; he made sure there was enough that we all had our fair share? What about men? Do you believe that God intended for every woman to be married? Is there a shortage of men that some women can’t help but to sleep with married men or men that are already in a relationship? Many of us won’t make it down the aisle but it doesn’t mean that you covet your sister’s (another woman’s) husband etc. As women we have to make personal decisions as to what we want, what we expect, what we will allow, etc. It will ultimately be your choice; but can you live with it? Will you be able to sleep at night? We aren’t perfect ladies but we should strive to be better one day at a time. When you want to say something negative; think positive and speak positive! When you want to do something hurtful and mean; do something nice and rewarding that others will admire and appreciate! When you just can’t come to do or say anything good; pray about it and ask for forgiveness, guidance and let him heal and comfort you. Remember we can get there! We can get on one accord! We can create a unity! One step at a time. Repeat after me: I am my sister’s keeper. I am so passionate about this subject that I am writing a book about it. I am still in the beginning stages and hope to have it complete before the new year! I would love to hear from you and your thoughts. Leave your comments in the comment section and let’s talk. They are all on sale for month of October! Last year, around this same time, I lit a candle in my window in observance of World Suicide Prevention Day. I repeated those steps again this year. Maybe you know someone who lost their life to suicide. Maybe you made an attempt to end your life, like I did. Either way, it is a blessing to know that there are organizations that help someone when they are in need. What happens when you are at the end of your road? When the money runs out or the abuse won’t stop? How do you clear your mind when you can’t focus or how do you stop your body from failing? When you are at the end of your road and you just can’t do it anymore… what do you do? Some people say that suicide is “the coward’s way out” of a bad situation. At some level, maybe I agree with that. I was in a bad situation when I tried to end my life; my then-husband was physically and emotionally abusive to my daughters and I. He was “in-between jobs” AGAIN and we found ourselves homeless. I was traveling to every food bank that I could find and borrowing money, just to keep us in a hotel room. The car was repossessed, the storage garage had locked us out for non-payment and the emergency room doctor had just diagnosed me with diabetes. Our situation was bad. Now, I don’t believe that I was really trying to get out of this bad situation, but when my mind became cloudy and the insomnia had me deep in a cavern, ending my life seemed to be the best solution for my daughters. Major depression is a real illness and it had landed on my back. How could I imagine ending my life while raising my daughters in abuse? The mental illness convinced me that once I was dead, my girls would be raised by their father and his family. They wouldn’t have to endure their stepfather’s abuse and they wouldn’t have to grow old thinking that their mother didn’t want them anymore. You see, in my mind I thought that my death would be the best thing for them! I have since learned that major depression is an illness with life-altering and life-threatening symptoms. Don’t just think that a person can “snap out of it” when they are bed-ridden. They are at the end of their road, as I was. When I wrote my first book entitled “Last Week… I Wanted To Die”, I had been symptom free for about a year. I was in counseling and I was medicated. Those pro-active steps were helping me. I was learning to recognize my symptoms and speak life over them, and over me. You see, I had to learn that. I was learning that when your mind tells you “NO”, you can speak “YES” and receive healing from the power of the Holy Spirit. Even if you don’t believe the words that you are speaking, your tongue has the power to heal, and I was speaking life over my situation. The Obstructive Sleep Apnea was controlled with the c-pap machine, and during those times when I still couldn’t sleep, I would pray. When the darkness set in and I couldn’t see the light, I would pray. I was at the end of MY road, so I learned to follow the road that God had set before me. When my ankles would swell from poor circulation and the acid re-flux would make it difficult to speak, I would pray. 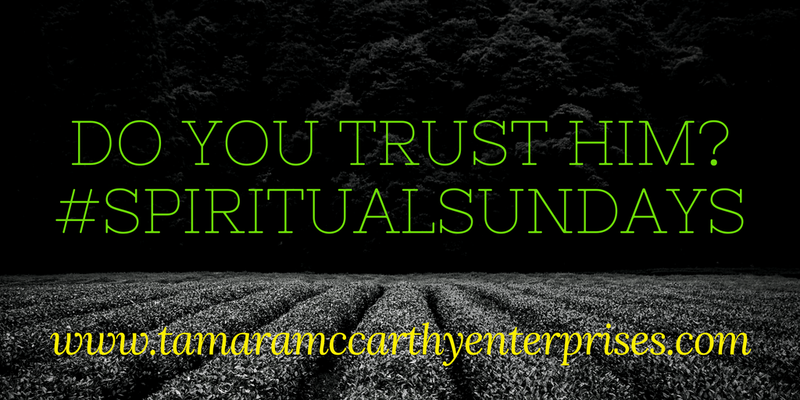 When I stood my ground and filed for divorce, and when I moved my daughter and I in to a garage-efficiency dwelling in the back of my landlord’s house… I was stepping out on faith. I didn’t KNOW that we would make it, I just believed in something bigger than myself. My Pastor was teaching on faith and I was listening! I kept on attending church, and I kept on hearing words of faith, hope, healing and love. I kept up with my medical appointments and stayed in counseling and on my medication. The words that were being spoken out loud in the sanctuary and reaching my ears were then being downloaded into my heart and coming out of my mouth! I was hearing life, I was loving life and I was speaking life over my darkness and over my situation while I was learning to live with and conquer major depression. Now, you can see and share that light, too! Come see us on #TheTOURthatAngieBEEpresents and meet other authors, speakers, workshop leaders and lovers of life and lovers of the Lord. Hope to meet you then.